Are there special names named by parents to their baby that has deep meaning from the Bible. Or does God instruct us what to name after the baby when we become parents to them? Human society now has gone so far from the original ways of the Creator. This is because of the darkness that envelopes the mind of an unbeliever. The evident result is their alienation from God; having been driven so far away because of the darkness in their hearts. The Bible is complete with its teachings regarding names.In fact, a name is one of the most important things in life that we have to consider.God’s name is an object of worship. The original Hebrew word (translated hallowed in English) is ‘hagiazo’, meaning to venerate. This shows the importance of God’s name.David have known this fact. He worshiped God’s name. In fact, the third of the ten commandments prohibits the use of the name of God in vain. Enemies of God use God’s name in vain to deceive people. Even the name of the Lord Jesus Christ is being used by false prophets to mislead people. God’s name must properly be used on things that are of God. God’s people and God’s city are called by His name. 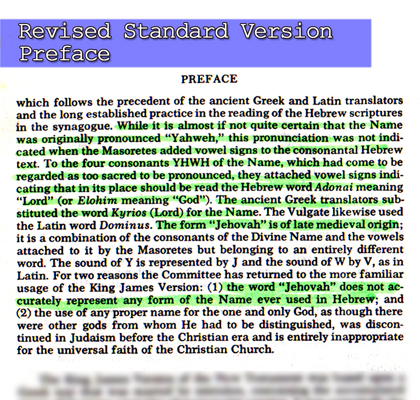 It is not proper to claim that a group or a church is of God and call it by the name of a man like; the Wesleyan Church (after the name of John Wesley), or the Lutheran Church (after the name of Martin Luther), or the Seventh Day Adventist Church (instead of using God’s name, they used ‘Seventh Day’) apparently proving that they are not of God! The Church in the Bible is named after its real Owner: God, hence, The Church of God. 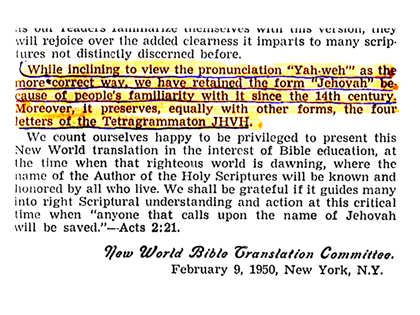 They are using the name Jehovah not because they believe it is the true name of God, but because of its popularity since the 14th century, inspite of the fact that they are “inclined to view the name Yahweh is a more correct form”. Names are also important for God’s people. We can choose a good name for our children, or a good name can be chosen by maintaining the dignity of our person. Wrong application of a name is a misnomer. God’s way of giving a name is with prudence. He named His only begotten Son, Jesus Christ.It spells the characteristic, the dignity, and the responsibility of His Son. The name Jesus Christ was given by God. 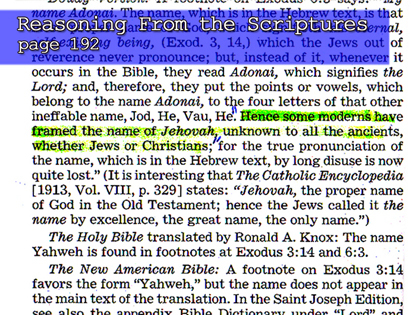 In naming a child, it is wise to consider circumstances, characteristics, and of course, the holiness that a name carries with it.You will notice that in the Bible, duplications of names are frequent like, the name John, Jesus, Jude, etc. Isaac was named so because when the angel announced that at her old age, Sarah will conceive and give birth to the promised seed, she laughed.Isaac means laughter. From H6711; laughter (that is, mockery); Jitschak (or Isaac), son of Abraham: – Isaac. Esau was named so because of his physical characteristics. Abram’s name was changed by God to be Abraham: making him to be the father of many nations. Maybe, my parents named me Eliseo, a prophet of the Old Testament times, because they were guided by the spirit of God, as to my ‘would-be’ calling. I have given names to so many babies in the past four decades; and most of them have grown up, with God’s help, to my expectation in the spirit of the name given them. Now, because people have gone too far from God’s way, you can hear names which are products of inverted names and, sometimes, the mixture of the first and second syllable of the father’s and mother’s name which does not denote anything holy. I am afraid that the next generations of people will be non-sensible people having nonsensical names. I hope and pray that this premonition be wrong. Previous StoryWas Jesus Christ An Essene? Next StoryAre We Being Pretentious? Who Cares? !